Above, at the National Railway Equipment Company, headquartered in Mt Vernon, Illinois, an elder EMD GP-9 (I suspect former BNSF, though not entirely certain) is broken apart and re-created into a more efficient and modern engine. 50 minutes in length, but worth every minute. Fascinating. Sometimes, whilst traversing that great world-wide web, one comes across things that, depending upon your personal inclinations and interests, sometimes just make you wince in terrible pain. As you can see, the delivery of a brand new foreign-designed EMD-based locomotive is made from a ship to the dock itself via crane. With one teensy-weensy problem. As best I can tell, the locomotive depicted is an EDI Rail GT46C-ACe built in Australia. This locomotive was constructed between 2007 and 2012 at the Cardiff Locomotive Workshops in New South Wales, Sydney, Australia. They were AC-driven units rated at 4,490 hp. 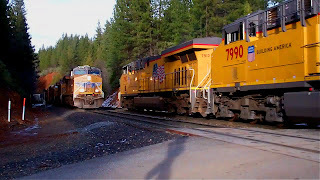 The prime mover was EMD's 16-cylinder 710 turbocharged engine. Unclear as to the specific port of delivery, but one can see that the sling closest to the videographer is first to fail. The back is clearly broken on this locomotive. Ladies and gentlemen, that was a very expensive drop. And right in front of me, no less. 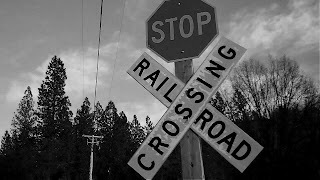 Certainly, there are times when you may catch, during your railfanning experience, a train meet in the middle or at the end. But I have had some astounding luck in catching train meets on point. The YouTube link is here. As per normal, I always suggest you go directly to the link and expand the video, wearing headphones, for the greatest Flip HD experience available. 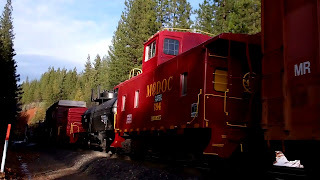 I emphasize that most of these train meets are by the dint of greatest chance; that said, I seem to somehow acquire more than my fair share of them -- though I am not by any means complaining! Usually, I've been chasing one specific train only to have another either round a curve or appear unexpectedly from a tunnel or from a direction I'd not anticipated. First, some details and then a closing comment. From the right (down-hill) on the #1 track comes UP 7913 West, a GE C45ACCTE in Union Pacific parlance; otherwise known as a GE ES44AC. Behind are UP 7490 and UP 8008, plus four other units with unrecorded numbers (for obvious reasons). This was a pristine, bright and new GE locomotive consist only, with no other train cars. I suspect this was a move, to the Roseville Yard, of additional new UP power. All of these locomotives have 4,400 hp. 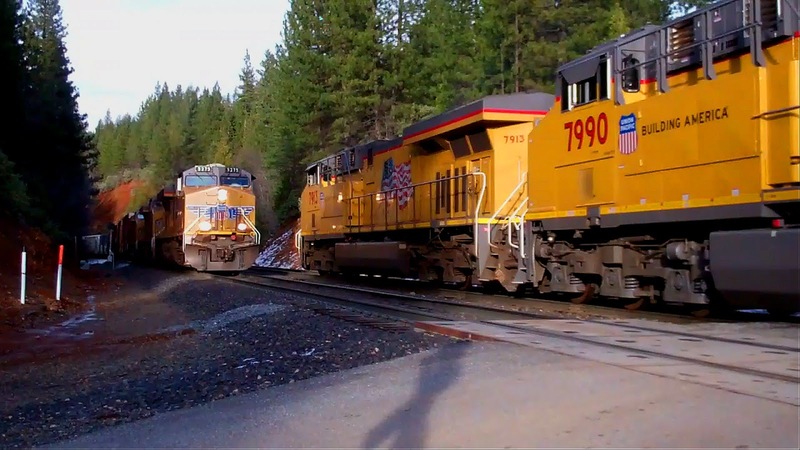 From the left (up-hill) on the #2 track comes UP 5275 East, with an older GE C45ACCTE on point, followed by UP 7384, UP 7446, and then mid-train helpers of UP 5255, UP 5052 (an EMD SD70M) and UP 7706. Q: Is it true Modoc Railroad Academy has relocated? A: The school has moved to Marion, Illinois effective 2-1-2013. I've been "chasing trains" since 1997, at the tail end of the Southern Pacific regime (at this point already having been outright purchased by the Union Pacific). 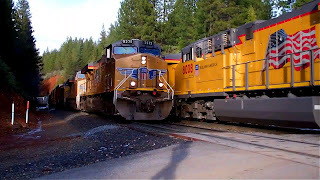 That means I have 16 years of train chasing "experience" on UP's Roseville Subdivision, from the Roseville Yard itself, over the Sierra Nevada mountains, right into Sparks, Nevada. In that amount of time I have, literally, walked most every mile of that route from Roseville to Sparks. Most of this is documented on 35mm print film, as well as some slide film; in -color and -chrome. 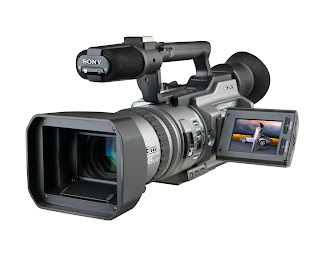 I have some miniDV video shot from a Sony DVX2000 that is highly valuable for its historic content. 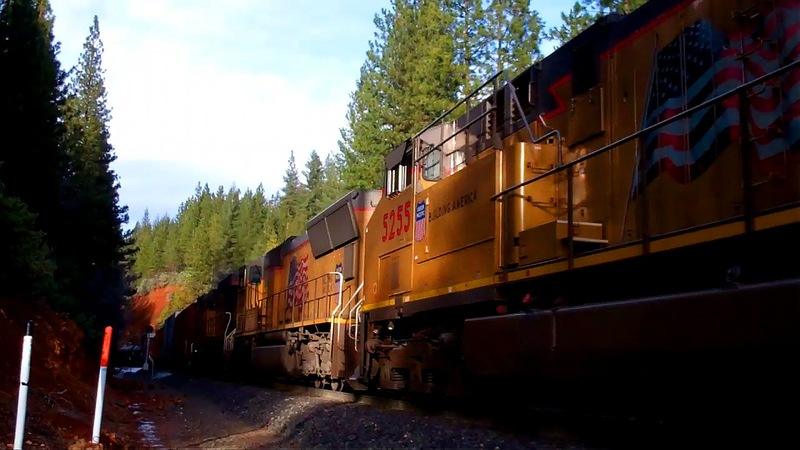 Some day I hope to take that content and create a series of videos appealing to rail and train enthusiasts interested in a bit of recent history involving both the Southern Pacific and Union Pacific railroads. My goal is to eventually offer this product on DVD. My blocking point is an appropriate video editing software suite and the time to utilize it, since I still work after 42 years in the field. I have considered Adobe Premiere, Avid (which I began to learn in the early 2000s and produced one VHS video), Sony Vegas and Apple's Final Cut Pro -- though I find Apple's OS more difficult to navigate. It's not as "intuitive" as many people tell you, in my opinion. In the meantime I'll simply have to rely on my about-to-become-moribund Flip HD, as well as the video capability of my Samsung Galaxy Note II. I am considering the purchase of Nikon's new d7100 which has a nice video feature. That, of course, would thusly demand that I have a said decent editing software suite. Learning curve, learning curve. In the meantime, thank you kindly for visiting, I solicit your comments, and be safe and well. Challenging times, they are a-coming. As before, click on each photo in order to enlarge. The photos above are stills from the video. You may copy and use these photographs for desktops or in other formats, as long as credit to me is provided. I consider this a very generous policy.